Aluminum: More Than Just Reynolds Wrap! It's time for another Tablescape Thursday with our hostess, Susan of Between Naps on the Porch. She's celebrating her one year Blogoversary! Stop by and wish her well. Please be sure to visit all the talented Tablescape participants. Speaking of Susan ... if you think my photographs have improved recently, it's to her credit. She shared tips about lighting, when not to use a flash, and so on. It's helped me tremendously! Thank you, Susan! 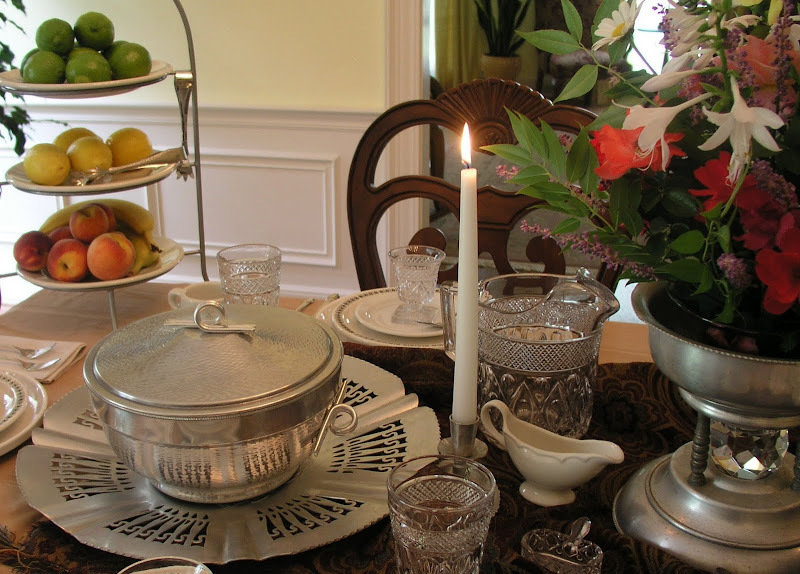 For this week’s tablescape, I’ve included several items from my collection of vintage aluminum serving pieces. My very first aluminum piece, and the one I love the most, is a round etched/hammered tray my mother made many years ago as a Home Demonstration Club project. I'll be sure to show it to you in a future post. 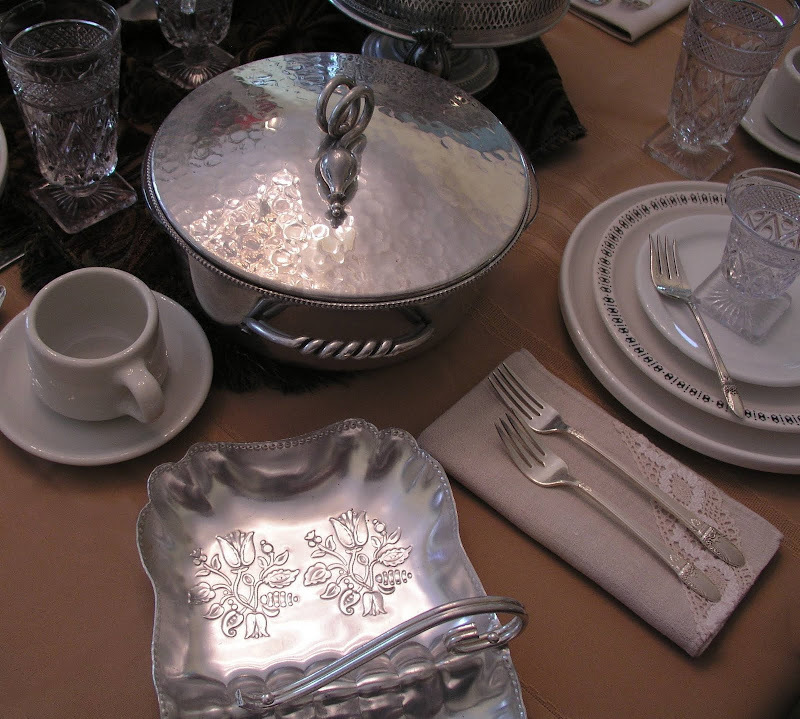 Popular during the 1930’s, 40’s, and 50’s (except during WWII, when aluminum was needed for the war effort), aluminum servingware was inexpensive, durable, and decorative. I like using it with the simple, sturdy restaurant/hotel dishes I’ve purchased at estate sales and thrift stores. Vintage aluminum pieces are still relatively inexpensive and are widely available. It seems to me that prices are far less standardized than for other collectibles, so it pays to shop around. I've found the best values at estate sales. I've also purchased a few pieces at Goodwill stores. Bright color is provided by this arrangement of cut flowers from the garden. The tablecloth is easy-care microfiber (that sounds better than saying polyester, doesn’t it?). I don’t always have the time or inclination to starch and iron table linens and, besides, I was ready to set the table for you! The patterned fabric is an upholstery-weight remnant. I frayed the edge to give it a fringed look (I haven’t done the other side yet, so it’s folded under!). 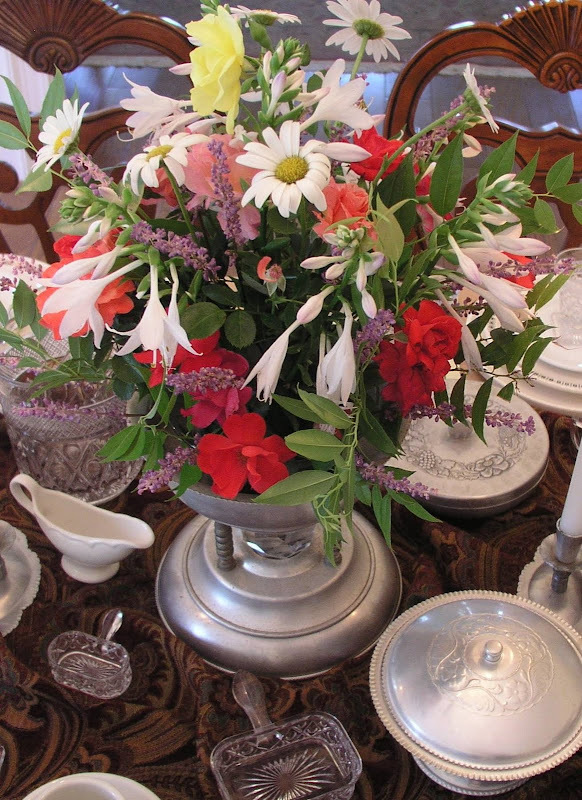 The chafing dish holding the flowers came from Goodwill, and cost $6.99. I put a faceted crystal votive holder in the center to add sparkle. I pre-soaked “oasis” in water and arranged the flowers in a glass bowl. One of my favorite items on the table is a hammered aluminum ice bucket. The lid has a weighted mechanism that closes it when the handle is released. The glassware is vintage, “Cape Cod” by the Imperial Glass Company. It was manufactured from the 1930’s through the 70’s. It’s considered to be in the Elegant Glass category, but is sturdy and works well in relatively informal settings. It was marketed as a “masculine” pattern, often displayed in ads with plates that featured hunting scenes. It doesn’t seem to mind being washed in the dishwasher. I would NOT recommend washing vintage aluminum items in a dishwasher. I speak from experience. I’ve tried it, and it can cause a film/discoloration that I’ve been unable to remove. I’ve taken this covered casserole dish and pierced serving tray to a number of “pot luck” functions. Someone always suggests that I let them take it home, but so far I’ve been steadfast in my refusal to give it away! Did you notice the flatware chest on the sofa in the sitting room? I forgot it was there until after I'd taken the photograph! The flowers are a casual mixture of whatever I found blooming. There are a few tea roses, several no-spray varieties, fragrant hosta blooms, purple spikes from liriope (monkey grass), Shasta daisies, and greenery from an unidentified shrub. The yellow no-spray rose at the top is “Carefree Sunshine.” It grows fast (sort of sprawls in every direction) and looks great in early Summer (less so now), and it has a heavenly fragrance. For additional color, I put three plain restaurant-style plates on a three-tiered server and filled them with a variety of fresh fruit. OK, I realize the serving tongs make no sense in this application, but I think the shapes are interesting (I like the claws!). The covered dish works well for spinach/artichoke dip in a bread bowl surrounded by toasted bread, chips or veggies. If a few crumbs fall through the holes, it’s OK … I think they’re worth the trouble for the interest they add. The colors of the fruit repeat many of the colors in the flower arrangement. The little Homer Laughlin sauce boat was featured in my most recent “thrifty treasures” post. The “chargers” are large Crate & Barrel dinner plates. They’re a flat “coupe” shape, so they work well for either holding large quantities of food at mealtime or as an underplate. White dishes are extremely versatile. Food tends to look its best on a white backdrop, doesn’t it? The smaller plates with the black border are from an estate sale in Memphis. The backstamp says “InnKare, Memphis, Tenn.” I suspect they were manufactured for Holiday Inns, which is based in Memphis. The estate sale was at a huge house (it was on the market for 3.5 million dollars). Most of the furniture seemed wildly overpriced, but the kitchen items and linens were reasonable. I bought 12 of these plates for around $5. I wanted 12 more … but, along with a few other items I purchased, this was all I could carry to the car (which was some distance away). How I wish I’d gone back for the rest! The bread plates (under the Cape Cod oyster/cocktail glasses) and the mugs and saucers are also restaurant-ware ... from Goodwill. The napkins are linen with cotton lace trim. I bought 8 for $2 at an estate sale. They were half price on the 2nd day of the sale. 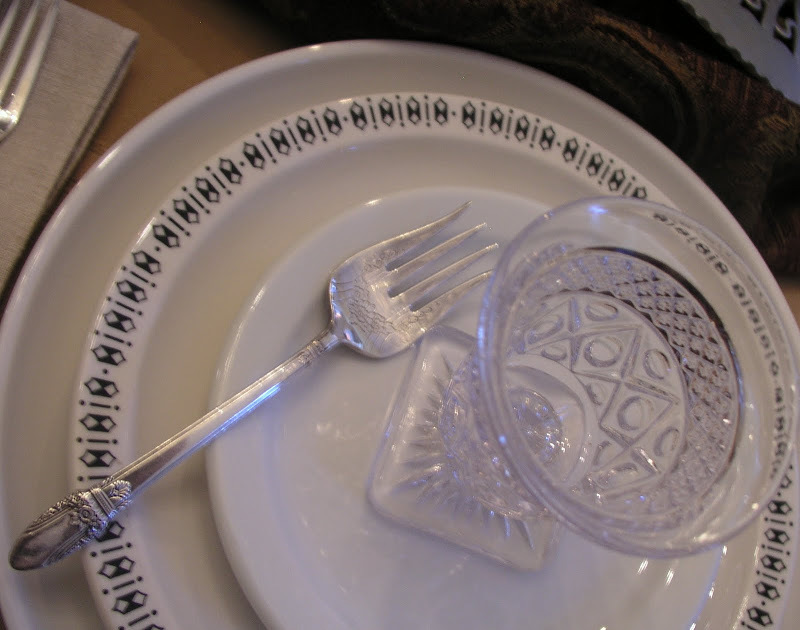 The flatware is “First Love” by 1847 Rogers Brothers. It’s their all-time most popular pattern. This set is the grille, or viande, style featuring long-handled knives and dinner forks. I like the raised pattern on this center-handled relish tray. Some aluminum pieces tend to be much shinier than others. The casserole lid is hammered aluminum. Some people collect either smooth or hammered pieces; I like both. This little fork was made especially for eating chipped beef! Does anyone actually eat chipped beef anymore? I’d use it as a salad or dessert fork. Evening was approaching so I added a few tea lights … one at each place setting. 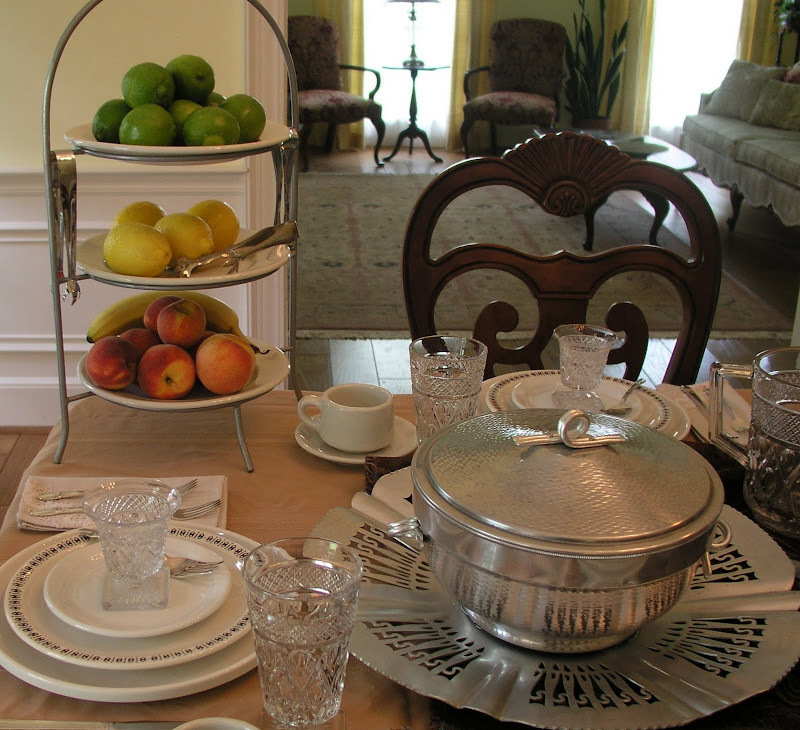 The handled item in the lower left corner is a “silent butler,” to be used as a receptacle for crumbs brushed from the table between courses. As the day nears its end, tea lights contribute warmth and sparkle. Nighttime arrives, and candlelight becomes the only illumination. At a candlelit dinner, the silver (or aluminum) takes on a warm romantic glow. Crystal sparkles and, best of all, the guests (and hosts!) look wonderful in the most flattering of all lighting conditions! What do you suppose is (or should) be under all those lids. Can you suggest the perfect menu for this vintage setting? No creamed chipped beef on toast, OK? A very beautiful table -- but you always set a nice table. I always love all your things as well. And I love the specialty forks -- love all the "odd" serving pieces. Beautiful table as usual, all the serving pieces were wonderful. I like the way you are able to educate everyone on the elements used in your tablescapes. Keep up the inspiration. Absolutely gorgeous Bill! I love it in candlelight! Wow! I think I'm going to have to try a candlelight table. Bill, too bad you're not my neighbor--I'd be so inspired ALL the time! Your table looks fantastic! I love all your vintage pieces! Great job on the photography, too! Goodwill is obviously good to Bill! This is a beautiful table! It looks equally beautiful in sunlight as in candlelight. Your covered dish compliments your newer casserole dish very nicely. And I love how the swirled handles on the tops of each compliment the handle of your divided serving tray. That really looks fabulous in the candle light. Are you 8 feet tall or do you climb on a chair to take those shots. Very elegant Bill .. Love the Candlelight! I agree with Eileen.. Goodwill is very good to you. Beautiful and beyond! You have done a brilliant job with this tablescape. All of your elements, the dishes and aluminium pieces are gorgeous. They look like a million bucks. We're gonna have to start calling you "Goodbill".... hmmmm..where in TN. did you say you live?!? You have hit a gold mine. I used to live in Chattanooga and the Goodwill there had nothing like this!!! Great job and beautiful photography! Ah - your table sparkles -- I've just started noticing lots of the aluminium pieces - my mother didn't have any but as I recall, my grandmother had several pieces. I need your lesson in photography (especially the candlelight) - lovely! Bill, this is gorgeous! I love this table! And EVERYthing you have placed so carefully upon it! I don't have a favorite, can't comment on just one thing because it is all beautiful. The lighting makes such a statement. Amazing post! Your pictures are wonderful. I also love the descriptiions of all the pieces. The fresh fruit adds a lovely vibrance to the photographs. Another great job Bill! Love the photos. You need to share Susan's tips. I know my photos have improved since I started. And lighting is a BIG deal. Keep up the good work and happy tablescaping! Bill...your table setting is gorgeous! I never realized how elegant and pretty aluminum could be! It is really stunning on the table! Your floral arrangement is amazing...I think we need a tour of your garden for Outdoor Wednesday sometime! :-) I'm not sure what chipped beef is :-) but I love the reflection of the glass on the fork. You have such beautiful flatware! Your candlelight pics are completly enchanting...oh, to dine at this beautiful table! 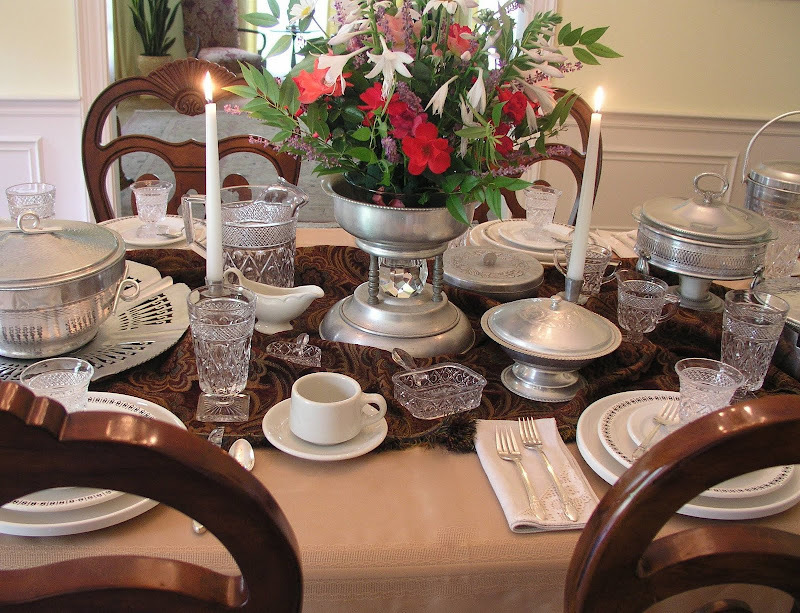 Thanks for a wonderful Tablescape Thursday! Beautiful table setting! The estate sale in Memphis is probabley the one I keep saying - Don't go - stay away- you can't afford, etc. It is the talk of the town! You are so creative! It is all so beautiful! I love the nighttime pictures! I used to have one of those ice buckets, don't remember what happened to it! That was lovely! Very interesting descriptions, too! You put the table together beautifully, Bill. And Susan IS a sweetheart! Your tablescape is lovely. I never knew to much about aluminum but I love it. Your pieces are great and I love your beautiful colorful centerpiece. You do have some wonderful flowers in the garden. Your photos are terrific. Where can I get some of those lighting tips? The evening pictures are magical. Thanks for sharing and I am sure any memu would be perfect for your table. Bill- I love it! I think I have actually given some of this to Goodwill myself! You have used my "First Love"--I love mine! I think the menu should be southern retro!--A congealed salad or tomato aspic, some kind of chicken casserole, and pineapple upside down cake for dessert!Lovely table and photos--you never disappoint! Bill- this all looks amazing. I have some of the same pieces. I just love it all, don't you? I love your table setting and it looks perfect with the candlelight ~ everything looks so sparkly and romantic. I remember the first time I saw someone use a silent butler ~ we were at a poncy restaurant and the waiter came and brushed the imaginary crumbs from the table, after each course. I had to laugh to myself, as had never seen this done before. What a lovely and unique tablescape! Thanks for sharing. It was a real treat to visit today. Happy Tablescape Thursday and hope to see you at my place to toast Susan on her anniversary. I love the aluminum serving pieces. Who would of thought a.iminum could look so elegant? I think my Mom had a piece of this. Stunning is the only word that comes to mind! Your eye for beauty astounds me. Many of the aluminum pieces are similar to those my mother gave away when she moved...most to Goodwill. I never thought of keeping them. After seeing your latest table, I am kicking myself. I just hope someone with vision like yours finds Mom's pieces and treasures them. Hi Bill! I have to say that chipped beef is a classic!!! My mother made it the best! She also did a version for breakfast using sausage! I'm ok with having chipped beef! :) I really like the "Innkare" plates...the whole table is beautiful!! I think your photography is really nice here. Okay, now this should be in a retro magazine. It is stunning. It just jumped off the page at me because I had an Aunt who collected the hammered aluminum. We never appreciated it as kids, and now I wonder what happened to her collection. The casserole looks as though it would be heavy, but I know that it isn't. I love the handle. I would enjoy a dinner of beef bourguignon sitting at this wonderful table. Yes? The hammered aluminum is great and is especially over the top in the candle light. Such fun retro! I have a couple of pieces and I love it. Hope all is great with you. Hello Bill~ Thank you for sharing another STUNNING table-masterpiece! You've presented aluminum ware in the most appealing way. Honestly, I have never been drawn to it, nor have been fond of it until your presentation. GREAT job!! Oh and the Imperial Cape Cod is calling my name, love that heavy, sturdy glassware. We cam always count on you to bring us fabulous tablescapes. Thank you for sharing! ~ m.
P.S. Although we don't eat much beef any more, I can just picture a classically prepared Beef Bourguignon in one of those beautiful serving pieces. Your table is beautful! I love the rich brown color of your runner, I think it really brings a "warmth" to the lovely aluminum pieces you are showcasing. The flower arrangement is amazing and the colors just pop from the table! The whole picture is so inviting and warm! So what time is dinner? For goodness sakes, Bill, only you could make aluminum look as elegant as silver! I only have a couple of pieces of hammered aluminum, and now I'll never look at those humble pieces the same way again. I really enjoyed this post and I'm impressed at how much you know about the history and functionality of your table ware. Who would have ever known that chipped beef had it's own special fork? Thanks for checking up on me, you're so sweet! Things are still a mess, but I've got some major renovations happening soon. Can't wait to share them with you! Take care! How lovely! The shiny pieces add a nice sparkle to your 'scape. Put with the white, it looks very elegant. Love your dinner by candlelight pics! Hello Bill!! Your table is amazing!! My great grandmother had some of the Aluminum pieces and they were so nice. Your tablescape is so beautiful. Please come see my goodwill finds that you inspired me to go find!! Bill, your table is amazing. I now know why I have started to collect the aluminum! I know where there is some more and I will be going there today! Lovely pewter touches, people really don't appreciate it any longer, do they? I found you on Gloria's blog and thought I'd stop by for a look. So glad I did! What a lovely tablescape! Your aluminum ware is fabulous. I've really enjoyed looking through your blog Bill. Bill, this is one of my favorites. I love hammered aluminum, and your flair for design has made a stunning table setting. I hope you'll join us again for Pink Saturday sometime. This is of course stunning!! I LOVE the hammered aluminum! And the fork for "chipped beef"? I want to frame it!! I LOVE IT!! The setting is beautiful, beautiful!! I am going to go listen to Sam Harris sing Somewhere Over the Rainbow now!! Totally adore your casserole dishes, oh how I'd love to get my hands on those. Just a beautiful, elegant setting. Now you ask for suggestions for this vintage setting, so it made me think of vintage recipes. When I googled 1940s casserole the first recipe that popped up came from the January 1943 issue of Gourmet Magazine. I thought to myself — perfect! Then I clicked on it and found "Lamb Hearts En Casserole A' La D'Darenberg" and I thought to myself — not so perfect. Amazing what we used to eat, isn't it? I have serveral pieces of aluminum serving pieces that belonged to my mother. I love them and the best part is they don't tarnish here is Florida! In answer to your question on my blog, yes, silver tarnishes much more so here in Florida. Don't even think about moving here with all your beautiful pieces, polishing would become a full-time job. And yes, you have to watch for mold and mildew inside and outside the house. One of the downsides of living in a tropical environment, but the benefits outweigh them! Bill, I have just stumbled upon your blog. I just love your table setting! What amazing aluminum pieces you have! Alos I can't resist anything with a crystal prism brillant idea! Some charming pieces, but I especially love your title! Bill, your tablescape once again is beautiful. You have the most amazing collection of serving pieces. I so look forward to Thursdays! Thanks for sharing your vast knowledge of the history that goes with your collections. You are right, the picture quality is amazing, you have really got it pulled together! How nice to be able to properly showcase your beautiful work (or is it play?! )and those amazing collections of yours! Bill, you've set a beautifully vintage looking table with your aluminum ware. Just gorgeous and classy. Your photos DO look nice, too. BTW, do you use Live Writer or Blogger to post? Pics don't enlarge to full page on Writer and I can't always use their "large" (about 1000x780)mode- cuz then they are waaay larger than 640x480(medium). Anyway, you've created another lovely post once again! Hi Dear Bill! Oh, I am never disappointed coming to see your tables. This one is no exception! Love the aluminum pieces. I have an ice bucket and just love the old retro look of it. You have some lovely pieces. Do you have a special place where you keep these pieces? The glassware is beautiful! Oh, I could go on an on. Thank you for sharing all your beautifulness! A beautiful table. I just loved the aliminum pieces. I see them often in my thrifting adventures. I'll be taking another look at them from now on. Wow, what a beautiful collection! I love the hammered ones! I see these at thrift stores every once in awhile and if storage weren't an issue I would probably buy some! I had never really looked much at aluminum, but wow, it looks incredible the way you have put it all together! I'll be keeping my eyes open for it now. You have put it all together in such a spectacular fashion. So well done! Also love the night shots with the candlelight. Excellent photography. I have never seen aluminum look so fantastic. I just happened across your blog and love what you do. Had to laugh about the "creamed chipped beef"! If by chance it was SOS under the lid...it would look fabulous! Your tablescape is absoultely devine! I plan to participate in my first Tablescape Thursday in the near future. I would love it if you would share your some of you photography techniques. Your name just kept popping up on the new blogs I've been discovering this week, so I came to take a look. All I can say is "formidable!" Guess you got yourself another follower. Your table is just breathtaking, especially by candlelight.I remember seeing pieces aluminum wear like that.The flowers are just gorgeous.You really went all out and it shows.You don't have to have exspensive china and tablewear to have set a beautiful table.I like heay tablewear.Also cooking pots.I still use my Mothers old iron skillets everyday.Some are antiques. DON'T YOU JUST LOVE GOOD OLE' GOODWILL, I LOVE IT! I CAN'T TELL PEOPLE ENOUGH, THAT I KNOW, THAT THEY HAVE SO MANY TREASURES THERE..... AND THE PIC'S ARE GREAT. LOVE THE CANDLE LITE, VERY ROMANTIC..... GOOD JOB!!! Bill, thanks for visiting. I still can't get over your love of these metal beauties that we all look over when they are heaped in a pile in cobwebs needing your kinda love. I can't wait to organize myself and dedicate a post to you of some recent treasures...nothing like you've got but you'd appreciate my attempt to expand a little. That hammered top covered babe with the fruit or knot can't be the one you just showed from that storage unit sale?? Dish love, xox! Wow! Bill! Your photos have improved! but wow also to your table! I love hammered aluminum too, but have not one piece of it. I had a party a few years back and the caterer used her collection for serving pieces. It was great with my casual style, but you have really upped the class factor by pairing it with the cut glass and crystal! Nice choices! I got some inspiration from this! And thank you SO much for your advice on the table runner! Thank you for becomming a follower to my blog. Your house is beautiful, and I have enjoyed reading your posts for several weeks now. Your pictures are great. Hi Bill, thank you for coming across the pond to Surrey and leaving a comment. I never realised there was such an art to laying a table. All you Americans have such great stuff and a lot say they buy them in "thrift" shops!! I wonder where you store all the items when not in use? Your fresh garden flowers were lovely as was the fruit. I wonder what food you all serve and is it all very artisitic too? If I ever get back to the USA, ( maybe next year for my 60th birthday) I will have to bring an empty suitcase and shop in these thrift shops, although in our small bungalow I have limited storage!! Oh my goodness, that is just stunning! I feel like I have learned so much about the aluminum pieces. I can't really remember seeing much of it before when I have been out saleing and thrifting, but maybe I will now that I know what to look for. And your evening photography is really, really gorgeous. Thank you for the inspiration! Thanks so much for stopping by to see my TT contribution. Comparing mine to yours is sort of like comparing beer to champagne!! Well, I learned a little something new today, the beauty of aluminum, and it doesn't get any better than that. Your entire table is stunning. Your glassware just looks specatacular, especially by candlelight. I was so impressed by that. Other than loving every single thing on your table and wishimg I were sitting there right now (and could you please serve cream chipped beef on toast?? My all time fave childhood memory!! ), I wanted to ask you how you like the aroma of the white hosta flower. For a long while I had the variety with the lavender flower and then grew the species with the white flowers at the lake and was so surprised by how wonderfully fragrant those flowers are. If you put a vase full in a room, it is almost too much!! Love it! Have a great weekend, Bill!! How excited am I? Very! Very! I have never known anyone that collects aluminum, as I do! I have many pieces like yours. I love the chafing dish and the silent butler, I do not have these pieces. I started collecting for one of my daughter outdoor wedding. I bought a lot of my aluminum pieces in Philadelphia, Mississippi. Have a friend that has an antique shop and she would hold it for me. I too love the hammered and the smooth. I been all over the Southern States working and got to shop, I fell in love with Early American Prescut Crystal,which I used on a table for another daughter wedding. I keep on collecting, I found a town in Ashland,Arkansas, just at the Oklahoma line that has shops and shops of anything you could hope for. I now just collect the rarest pieces for I have a set of 12 of most all pieces. How I dislike the ironing! lol Somehow they always have wrinkles, no matter what! lol I bought 40 table cloths at an outlet in West Point, Mississippi for $200.00, I loaned most out and now only have 12 or so, live and learn. lol Now, You have inspired me to bring out my Aluminum and do a Tablescape! The setting is wonderful! OK I know you know I love it! 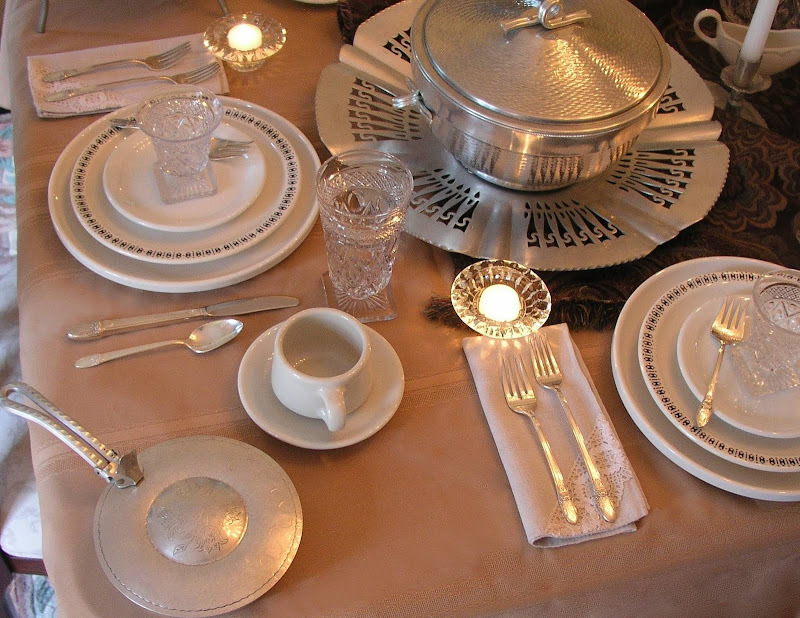 lol I would love to feature your Aluminum Tablescape on my next weeks, Weekly Featured Website, let me know if I can for I will have to download a picture of this setting. Bill, you've got such a huge following. I'm 1/2 intimidated just leavin' you comments. I hope you'll join in white dish party on 8/25 of Cuisine Kathleen. Also, have you noticed Eddie Ross' blog. He's really cool and I think you'd enjoy his posts. xox! What a stunning table! I love how you combined run of the mill restaurant ware with aluminum elements to make a table worthy of fine dining. Eveything is just perfect. The aluminum piece in the center is wonderful. I was going to suggest chipped beef on toast for the meal and then scrolled down and read your last line. LOL! A very enjoyable read so early this morning. What can I say but WOW! Okay, I have probably spent twenty minutes staring at your pictures. I have some aluminum pieces...probably 5 or 6 and now I cannot wait to set the table using them with my own white dinnerware. I have Cape Code cordials and sherbet dishes also. 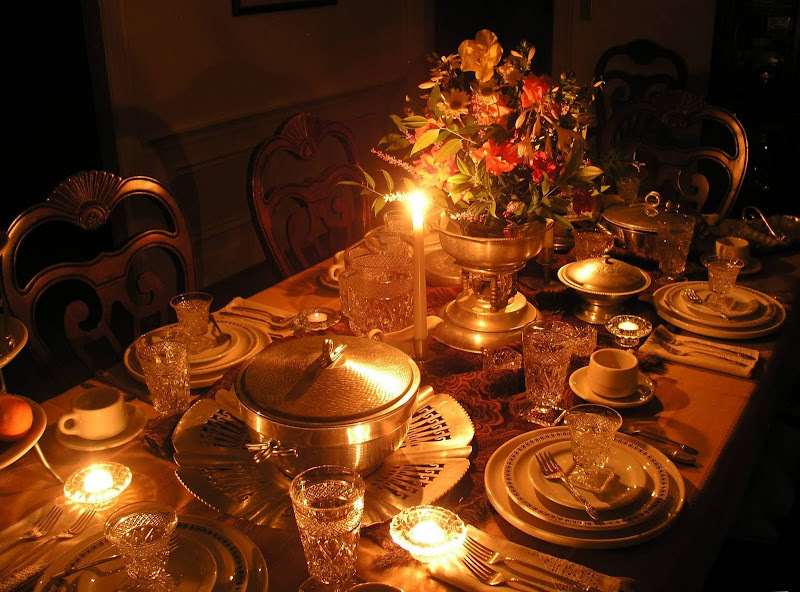 I love Tablescape Thursday and look at every one and always pick a favorite from them. Yours, hands down, is definitely it this weeks! WOW! What can I add to those comments. That is Wow ! May I come for diner please ? You really have the sense of hospitality, my dear. Have a very nice week, Bill. I love the aluminum serving pieces. I just discovered your blog --- how lovely. I was reading this post and looking at the pictures and thought that I spied First Love silver pattern because I have it also. And as I continued to read -- yes, that is what it is. I wrote a post about mine which I recently found in an antique store. I grew up with a "youth set" of this pattern and when I found this in the shop I also discovered that it was monogramed with my maiden name initial. Serendipity. Absolutely gorgeous! Not only do I love the table scape, but all your furniture is just lovely, too. I'm so glad I lucked upon your blog, it's so stylish & chic. this table is beyond words...absolutely outstanding, so visually interesting...I never would have thought of putting these beauties together...you are soooo creative!...every piece is lovely!...and yes, the pictures are wonderful..